There is mucho flappage going on in blogland about what to wear to the upcoming blogger events including Cybher, this weekend’s BlogCamp and BritMums Live. Bag on your head – For anonymous bloggers, though you might want to consider the health and safety aspects if it’s only your children who are anonymous. They can have a plastic bucket to wear instead. Get a brand to sponsor it, it’s a win-win solution. Nudist – For the daring amongst you. Some people need very little encouragement for this, and may be taking the pink Cybher theme a little too far. The main problem with this option is where do you put your dongle? Slogan T shirts – You have many options here , but don’t bother with the ones that say I’m Blogging This. Of course you’re bloody blogging this, otherwise why else would you be there? There are a tidal wave of these type of tees, from My mom is blogging this for babies through to My wife is blogging this for VERY LUCKY MEN. Haven’t yet seen My dog is blogging this, though I can think of at least one person who’d wear that. 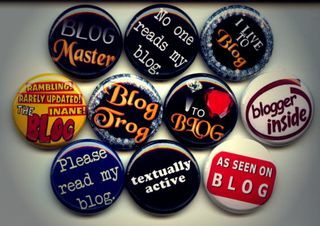 Special blogging pants – I think we’ll all be wearing these. They’re girls’ pants, but with an “authentic fly”. Me no understand. Must get out more. Or perhaps try a blogging thong, so every time you bend over you can do an impression of the Twitter fail whale. Slogan badges – For those who don’t like T shirts. I applaud the Please Refer to My Blog badge for managing to be polite and really quite ill-mannered at the same time. And don’t forget your accessories. For the coffee break, there’s this incredibly passive aggressive mug, or this one for the emotionally exhausted. I’m going with my daughter to Cybher, in our alter egos as El and Jae from Eljae. So far the best we have come up with is a T shirt that says ‘Follow’ for me and ‘No Follow’ for her but that’s kind of an obscure reference and carries with it the risk that Google might throw you out of the building. What to do? !